Our readings this Sunday continue the theme from last Sunday of the food that God gives us to sustain us on our journey; and our transition from earthly concerns to spiritual concerns. In our first reading (1 Kings 19:4-8), we hear the story of the prophet Elijah who was so disillusioned by the opposition to his ministry that he wanted to just give up. That's something that many people may identify with, at least sometimes. God intervened and provided food for Elijah's long journey through the desert to the mountain of God, Horeb. There, he would encounter God in the "tiny, whispering sound." 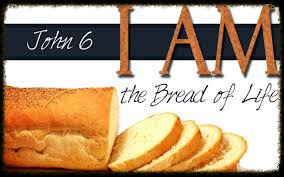 In our Gospel reading (John 6:41-51), we hear a continuation of Jesus' Bread of Life Discourse. The "Jews" (probably people who knew Jesus and his family) found it hard to accept Jesus' claims that he is the Messiah, the "bread that came down from heaven". They could not see beyond their earthly concerns and refused to accept that God can do anything. The Jews murmured about Jesus because he said, "I am the bread that came down from heaven, " and they said, "Is this not Jesus, the son of Joseph? Do we not know his father and mother? Then how can he say, 'I have come down from heaven'?" Jesus answered and said to them, "Stop murmuring among yourselves. No one can come to me unless the Father who sent me draw him, and I will raise him on the last day. It is written in the prophets: They shall all be taught by God. Everyone who listens to my Father and learns from him comes to me. Not that anyone has seen the Father except the one who is from God; he has seen the Father. Amen, amen, I say to you, whoever believes has eternal life. I am the bread of life. Your ancestors ate the manna in the desert, but they died; this is the bread that comes down from heaven so that one may eat it and not die. I am the living bread that came down from heaven; whoever eats this bread will live forever; and the bread that I will give is my flesh for the life of the world." In our Epistle reading (Ephesians 4:30-5:2), St. Paul describes how we Christians are to live in the Spirit. Nourished by the body and blood of Christ, we now have the grace and courage to be "imitators of God . . . to live in love." Both our first reading and Gospel passage lead us to the Eucharist. It is this spiritual food and drink that sustains us on our journey to the Father. In many ways, we are like Elijah, tired and disillusioned on the desert path towards the mountain of God. And then, the angel of the Lord appears and calls to us, "Get up and eat, lest the journey be too long for you." Perhaps this is what St. Thomas Aquinas had in mind when he wrote the song, Panis Angelicus. "The bread of angels has become the bread of men. . . the body of the Lord will nourish the poor and humble servant."